In this chapter, we will learn to login into the cPanel Dashboard. For logging into the dashboard, you will need your login credentials. This information is sent to you, when you have signed up for cPanel hosting or you may have created during purchase of hosting. cPanel Dashboard is accessible by two ports – 2082 for unsecured connections and 2083 for secured connection, many hosting providers support unsecured connections, but it is always recommended that you should use a secured connection only. Once you are redirected to your login screen, you will find the login screen like shown below. 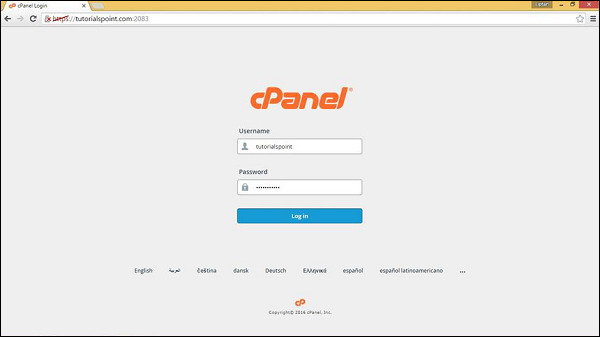 You can enter the Username and Password and press the Log in button to login into the cPanel Dashboard.